Hollywood glamour is fun, but investors prefer details. Disney (DIS - Get Report) unveiled Disney+, its direct-to-consumer streaming package, on Thursday. And no detail was spared in the three-hour showcase, which covered everything from its user interface and content mix to its international expansion plans -- and yes, the price of the service and exact launch date, which is $6.99 per month or $69.99 monthly, and launching on Nov. 12. Investors cheered the Disney+ reveal, with Disney shares surging to an all-time high on Friday following the presentation. Disney stock closed up 11.54% to $130.06 on Friday. 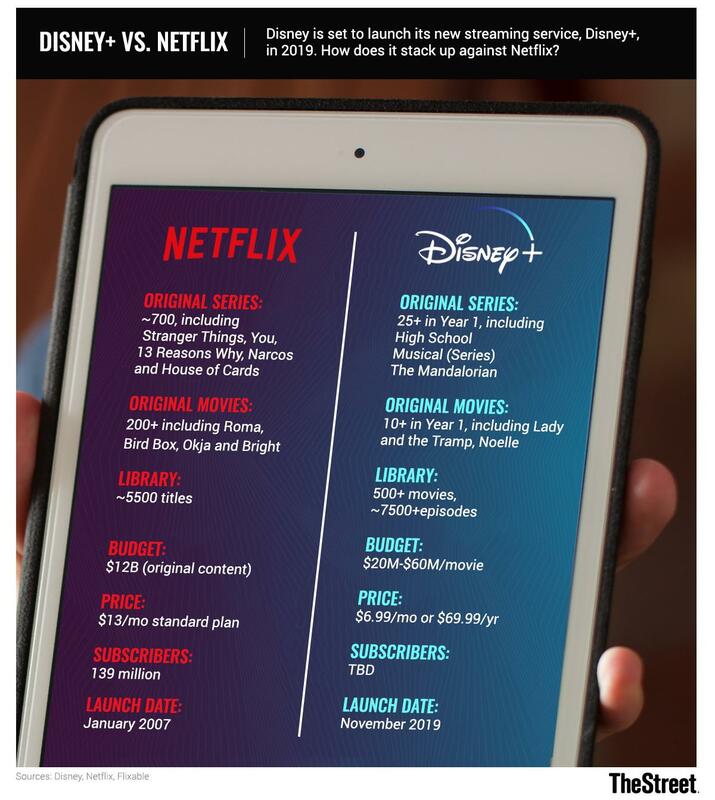 CFRA Research analyst Tuna N. Amobi summed up much of the investor reaction to Disney's big show in a note on Friday, writing: "Disney provided the most detailed insights yet into its new subscription-based streaming service (Disney+), with a U.S. launch now set for November 12. We were fairly impressed with a demo of the user interface for the new offering, with an unparalleled array of branded TV/film content." By contrast, and in hindsight, Apple (AAPL - Get Report) looked downright cagey in its own reveal of Apple TV Channels and TV+ just weeks earlier. Hollywood heavyweights including Steven Spielberg, Jennifer Aniston and even the Queen of All Media herself, Oprah Winfrey, joined Apple execs to preview some of the programming that will be on TV+. It was glitzy. It was polished. And it was even punctuated by a full-throated Oprah shout-out to the linchpin of Apple's services strategy: Its global installed base of 1.4 billion devices. Price and a launch date, however? No sign yet. Nor any details on bundling options or the sum total of what subscribers will get for their their money -- whatever that price may be. Apple shares are up roughly 6.5% since the Mar. 25 event, but many investors scratched their heads about the lack of specifics in Apple's eagerly anticipated services event. And analysts are also speculating on how Disney+ will impact Apple's own streaming aspirations; shares of Apple were down slightly on Friday on an otherwise strong day for the markets, possibly because of Disney's announcements. Certainly, there's still plenty of room for surprise in the fast-evolving space, and Apple may be banking on that -- not to mention its loyal installed base -- as it advances towards a 2019 launch of TV+. But star power will only get you so far. So at least for now, consider Apple thoroughly upstaged. Apple and Disney are holdings in Jim Cramer's Action Alerts PLUS Charitable Trust Portfolio. Want to be alerted before Cramer buys or sells these stocks? Learn more now.